When I returned home on Monday I had a parcel waiting for me at the post office. I was so excited to receive my book order from Amazon. Why? 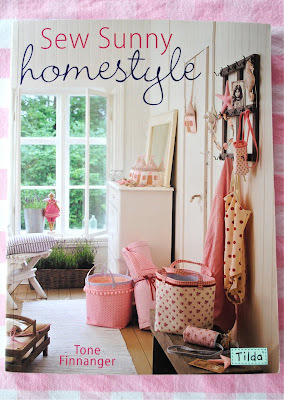 Because, among other books, I purchased "Sew Sunny Homestyle" by Tone Finnanger. I had been aching to get my hands on it. There are loads of easy projects to make. And of course I got started straight away. Making fabric ice-creams. A bit of fun. A smile or two. That's made me happy today. I have that book too and really enjoy it! Hi Simone- I hope you had a wonderful trip. I just love when I order stuff and see a package the postman delivered sitting on my front step. Books, especially creative ones are my favorite. I would be devouring it by now. I hope you enjoy it. I will have to go check it out, it looks like a book I would like. Those ice creams are so cute! Made me smile, thanks dear! How pretty! I love the snow cones! 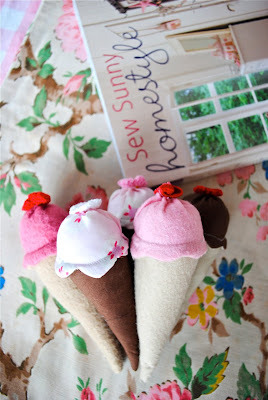 I'm going to have to look that book up, the ice cream cones are super cute!!! Those are really cute!Packages in the mail are sooo fun! Soo cute! Can't wait to see more! What cute icecreams! That book looks like a load of fun, just the cover makes me itch to have a read through! Enjoy it, and your day! wish i knew how to sew! i'd love to make some of these clever projects. LOVE all these books..quite a few in the series..
the cones are TOOO cute..
where are you going to display them?? I saw that one in the window of the bookshop just today! Didn't have time to pop in and investigate further -- is there some fabby sewing projects in there? Even for an amateur?? Oh, so cute! I love these so much! Wow, quick work, they are sooo sweet. The book looks great. We must both have a sweet tooth today , are't they just the cutest things !! I do love Tilda ! The ice cream cones are so cute! Can't wait to see more projects! If those cute cones are anything to go by, you are going to have a lot of fun with your new book! I must keep an eye out in the bookstores for that one. Simone, Love what you did for ice cream cones.. It's snowing this morning again here in Maine. My next post is The USA CHAMPIONSHIP Toboggan races, I am Going, People from everywhere come..
i love al of the pinkt ones in the rom picture. and those ice creamies are too cute! 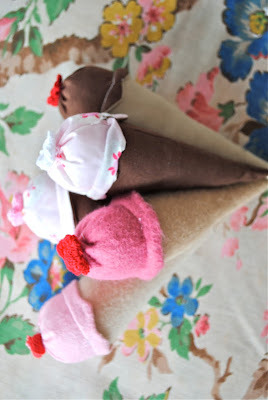 'Love your fabric ice cream cones! Such fun! They'd make a cut arrangement in just the right container too! Enjoy! Oh Simone, this looks like a great and inspiring book! Love the bookcover and the cones! Looking forward to see what you make! Looks like a fun book full of fun projects for you! I love those! Great job Simone! You always give us something inspirig... Thanks! I lose hours in book stores, flicking through & looking at all the amazing images. The ice cream cones are adorable. My daughter has also added making a pair of your wonderful thongs to her craft list! Oh Simone, what a nice project. I like it. I didn't know this author. I must have this book too... Thanks for the reference. Thanks for your thoughts. We read every comment and appreciate your feedback. Do you remember the times? Project Day: My Dish Cloth Table Cloth! Beach Vintage Fix Via Inbox? Gathering Supplies, pretty rosey fabrics, ribbon and lace. Want home decorating fabrics at fab prices?